Origin: Northern Chihuahuan Desert of Texas, Rio Grande plains, southern Trans-Pecos and sparingly in the Edwards plateau. Landscape Use: Accent, informal hedge, background, screen, xeric and oasis design theme. Form & Character: Globular and rounded, nearly deciduous in winter, rounded to irregular, xeric and dry looking, informal (even though in Phoenix this is the 'shrub hacker's' 'shrub of choice' to butcher into common and/or obscure geometric shapes). Growth Habit: Evergreen to semi-evergreen woody perennial shrub, moderately upright and spreading to 8 to 12 feet in height with near equal spread. Foliage/texture: Small to 1 inch long, elliptic to obovate gray sessile leaves, tomentose; medium fine texture. Flowers & fruits: Many axillary magenta to lavender flowers bloom on new wood, flowers attract bees; fruits are inconspicuous. Seasonal color: Flowers episodically in intense bursts every 4 to 6 weeks during warm season usually starting in late March until November. Temperature: Tolerant of both desert heat and cold. However, some Texas ranger shrubs (especially the variety green cloud) will go partially deciduous during the winter months. Watering: Apply no supplemental water during winter. Irrigate as necessary during summer particularly during those summers when monsoon rains are sparse. 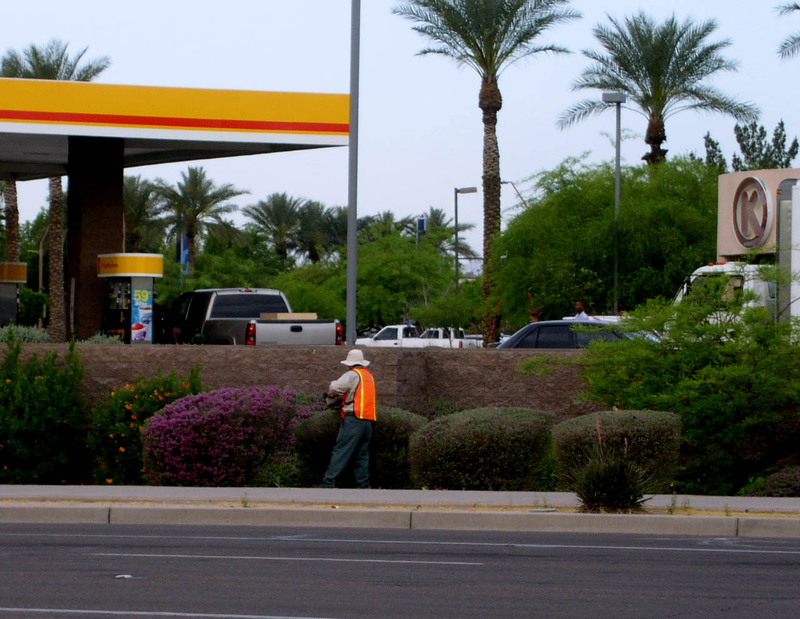 Special watering note: All in Phoenix must realize that the number one stimulant of landscape plant growth is irrigation water volume applied to landscapes. Therefore, use water wisely! Texas ranger is an iconic plant to practice this concept. Water Texas ranger less and it will respond with slower growth needing less pruning to keep it's size in check. 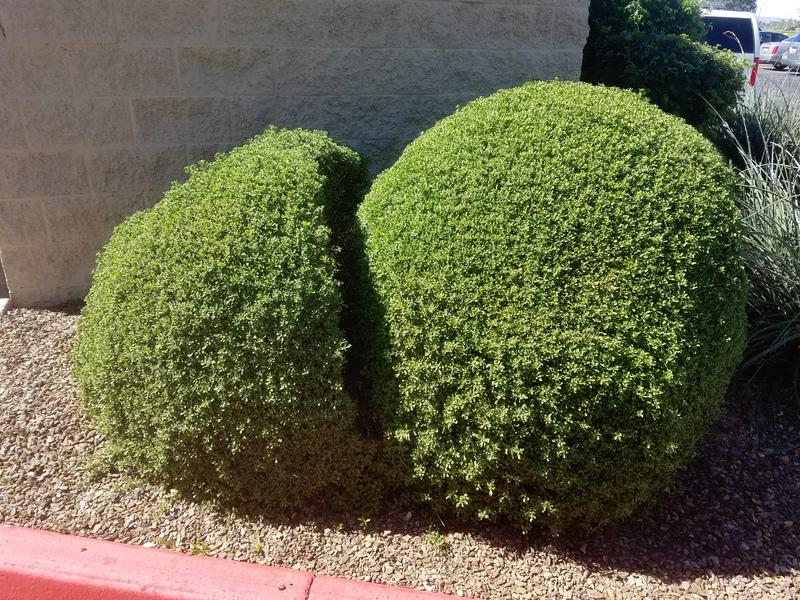 Pruning: One can remove any amount of vegetation from Texas ranger shrubs and they will respond with vigorous regrowth throughout the growing season. 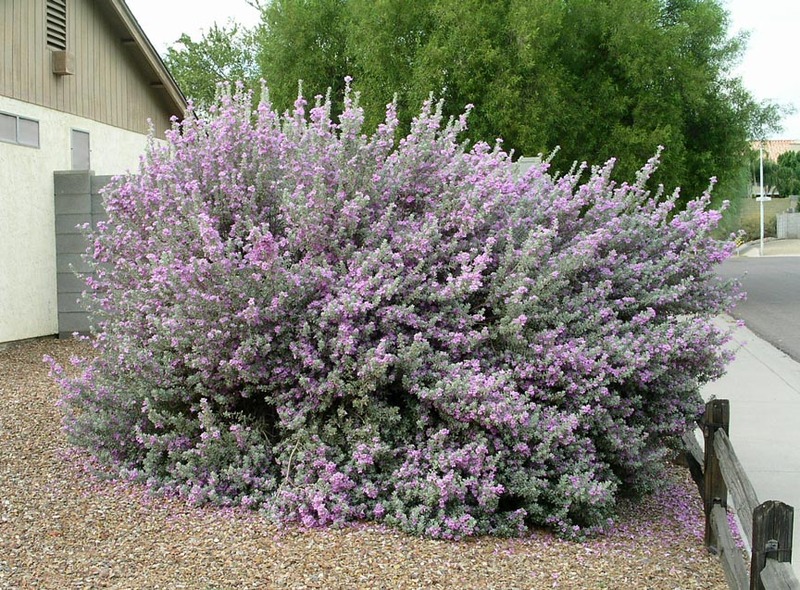 My recommendation is to extensively rejuvenate Texas ranger shrubs during late February to early March and then leave them alone for the remainder of the year. 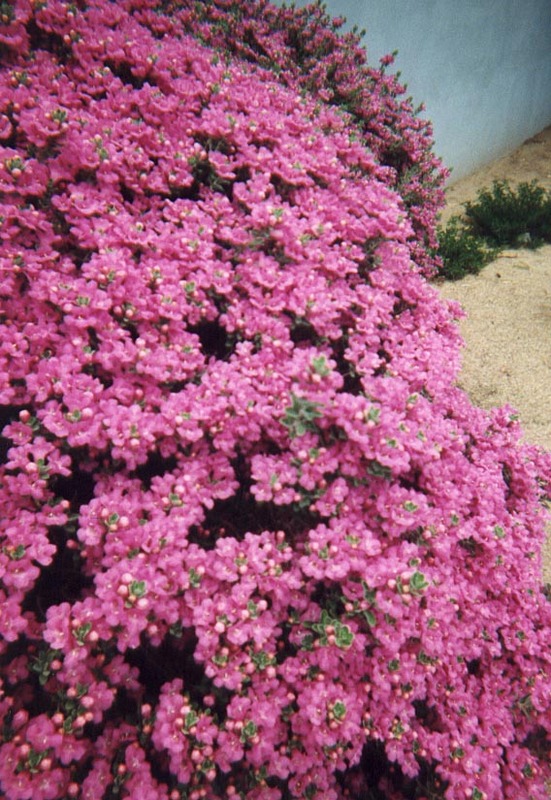 The result will be beautiful shrubs that have an appropriate size, a natural form, and flower profusely. When I prune Texas ranger shrubs this way I use hand pruners and/or loppers to remove stems at various lengths using heading and thinning cuts. When I'm finished pruning a Texas ranger shrub, I've removed about 2/3rds of its overall standing shoot mass. I'm content then to not prune it the rest of the year. I also water conservatively to promote a slow growth rate. 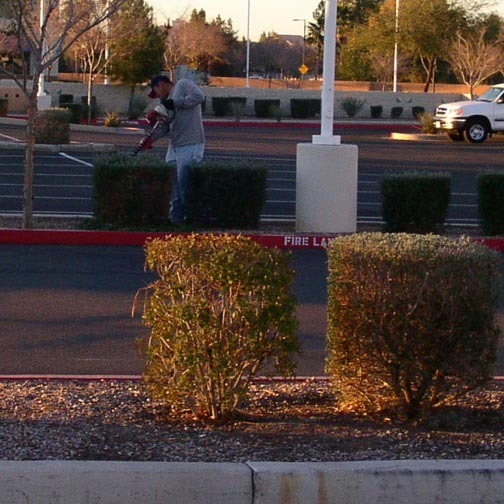 Sadly though, Texas ranger shrubs in Phoenix ARE the 'meatballer', 'Rubic's cube', 'beerkegger', 'loaf of bread', 'living totem pole' or 'landscape blocks' shrub of choice for ignoramus 'horticultural clods' to shear! Check it out and see 'em do it! 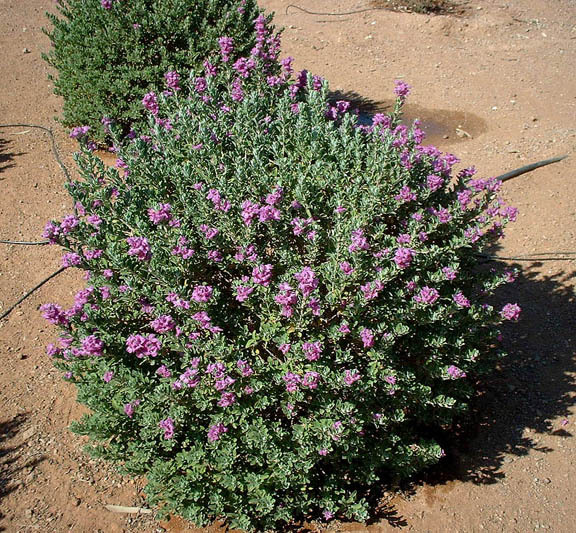 'Hort clods' (as they're duly nicknamed) shear Texas sage all year around even when flowering, to apparently show that they are indeed doing something called 'landscape maintenance' in order to justify receiving payment for their monthly billing statements. Please avoid this bogus practice and be a real horticulturist! Prune Texas ranger only once per year in early March. The ONLY exceptions to my professional recommendation are when one is trying to either create a migratory 'igloo for iguanas' in their front yard or to simulate a cosmic planetary collision. Propagation: Seed and cutting (softwood or semi-hardwood). Texas ranger shrubs will occasionally reseed in urban landscapes. 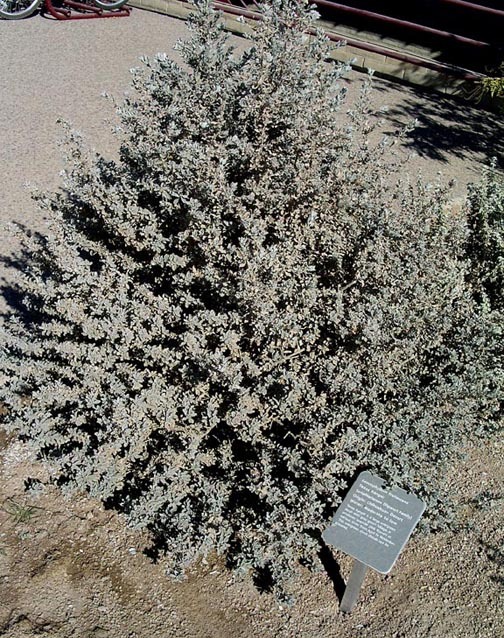 Disease and pests: In the Phoenix area, Texas root rot can kill Texas ranger shrubs in late August (soil temperatures must be above 80oF) if soils are poorly drained and the shrubs are growing on former agricultural soils. Additional comments: There are several varietal selections that have different foliage and flower colors. L. f. var. white cloud (white flowers and gray foliage - selected by Texas A&M University in 1977), L.f. var. green cloud (magenta flowers, more greenish foliage, loses more leaves in winter - selected in 1970 in the Rio Grande plains by the son of N.P. Maxwell), L. f. 'Compacta' (cultivated dwarf cultivar), and L. f. var. heavenly cloud has sparser foliage that makes the flowers more prominent. Recent research has shown that leaf extracts of Leucophyllum show strong phytotoxic, antimitotic activity (diayangambin, epiyangambin, diaesartemin, and epiashantin) inhibiting grass seed germination and seedling development of lettuce and onion. Special advisory note: Because of their dense leaf pubscence, Texas ranger shrubs are dust magnets! Several people I know (including yours truly) have developed rather significant allergic reactions to the dusty foliage of this otherwise magnificent shrub. So when working with this Texas ranger, its not unusual to haved allergic reactions ranging from coughing, congestion, sneezing, itching, watery eyes to outright wheezing. So what's my advice? When working with this plant, make sure to always wear a dust mask!! !